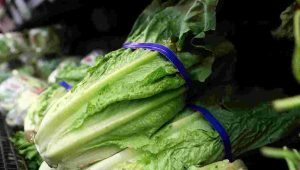 Officials from federal health agencies said on Friday that an E. coli outbreak linked to romaine lettuce widened and 98 people had become sickened by it. Over half of those that have fallen ill needed to be hospitalized due to this strain of E. coli in the outbreak being very strong, said officials from the U.S. Food & Drug Administration and the Center for Disease Control. People across 22 states reported E. coli sicknesses that have been linked to this most recent outbreak said the FDA and CDC. To date there have not been any deaths, but due to the bacteria causing this lasts outbreak being extremely virulent, everyone needs to avoid consuming romaine lettuce unless is not from the area of Yuma, Arizona, said a spokesperson from the CDC. The spokesperson told the media during a telephone conversation that people should not eat any romaine lettuce of any kind unless they are 100% sure that the lettuce was not from the Yuma area. This is the worst E. coli outbreak since 2006 when sicknesses traced back to spinach killed three people and sickened over 270. A single California farm was that outbreak’s source for the bacteria, which experts have decided might have been linked to cow manure that was tracked into the farm by the wild pigs there or spread via a stream. Harrison Farms located in Yuma, Arizona is where romaine lettuce came from that sickened eight inmates in an Alaskan prison said the FDA. The FDA and CDC are looking at 24 or more farms that might possibly be sources for the contaminated romaine. In Yuma, the growing season is over for lettuce, but the two federal agencies said they cannot guarantee the outbreak has ended. They said the possibility exists that the contaminated romaine is still on the shelves of grocery stores or in refrigerators at people’s homes. If you are not sure if the lettuce is romaine, it is best not to eat it and that includes lettuce that is part of a salad mix, said the CDC. Often times labels on packages will not identify where the growing region is. The CDC said those people who feel they might have become sickened with E. coli should see their doctor. coli bacteria usually are harmless, but there are strains that produce Shiga toxin that can cause people to become sick. That particular strain produces a toxin that is considered one of the worst.